From initial intake to final deliverables, keep your creative production process running smoothly with this creative request template. When you’re getting creative requests from email, chat, or passing conversations, it’s hard to get a clear view of all the work that needs to be done, let alone prioritize and kick off that work quickly. So how do you keep your creative team focused and productive on the right tasks? 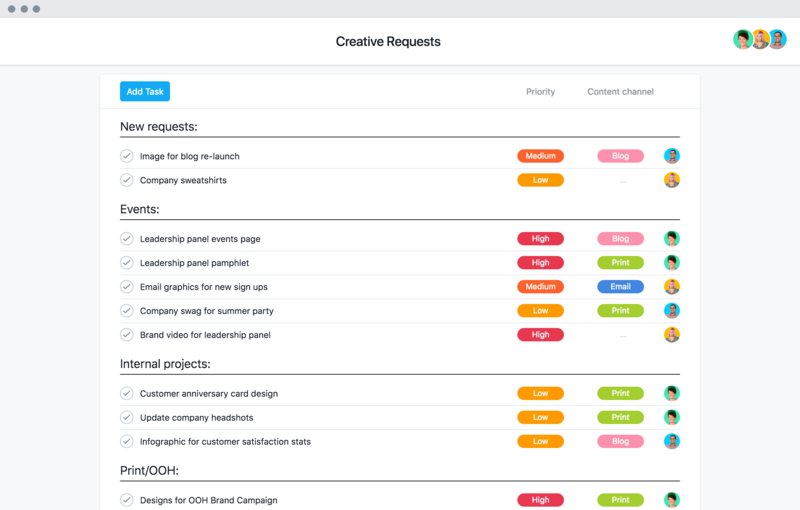 This creative request template makes it easy to streamline your process for managing incoming requests, prioritizing and assigning work, and collecting feedback—all in one place. Centralize all incoming requests. Keep priorities clear and understand everything your team is working on by managing all incoming requests in the same tool. Collect the right details. Missing information—like creative requirements or design specs—can delay work. Use a form so requests are submitted with all the necessary details. Set clear expectations. For every request you receive, determine its priority level, assign it to someone, and set deadlines so everyone is on the same page about who’s creating what and when. Speed up the feedback cycle. Make approvals clear by tracking them alongside creative work and assets. Days derailed by 'quick' questions? Introduce a more productive way to file and track work. See how to manage requests from across the company to keep everyone on the same page. Follow along with our tutorial so no work ideas get lost, but no teammates get bombarded. Cut the chaos that kills creativity by tracking and prioritizing incoming creative requests. Get our creative request template and more with a free trial of Asana Premium.